Permit penalty-free withdrawal from retirement savings accounts to pay retirement LTCI insurance premiums, recognizing that LTSS is a significant drain on retirement savings. Simplify state plan options and waivers under Medicaid to provide additional flexibility to states to offer home and community-based LTSS, as well as an “LTSS-only buy-in” as a supplement to private health insurance for working individuals with disabilities. Recognize that for the 15 percent of the population that will have significant LTSS expenses, the private market, and personal savings are not adequate to cover LTSS needs. Further, states will not be able to sustain spending for LTSS under Medicaid as baby boomers begin to need these services and supports. While BPC’s leaders stopped short of endorsing a public catastrophic program financed through an additional Medicare payroll tax on individuals, proposals to limit the federal share of Medicaid reimbursement could further stress state budgets, and limit the availability of Medicaid-covered LTSS. Since the release the February 2016 report, Initial Recommendations to Improve the Financing of Long-Term Care, which outlines these recommendations in detail, BPC has also issued two reports that have implications for LTSS financing and coordination of care for high-cost, high-need Medicare beneficiaries. These two reports, Delivery System Reform: Improving Care for Individuals Dually Eligible for Medicare and Medicaid and Improving Care for High-Need, High-Cost Medicare Patients, recommend providing additional flexibility to better integrate health and social services and supports for the highest-cost Medicare beneficiaries. Following on these reports and recommendations, BPC analyzed additional options and issues related to the financing of LTSS. After evaluating a variety of options discussed in more detail in this report, BPC offers the following recommendations to improve the availability of affordable LTCI and financing of LTSS. Over 12 million adults in the United States rely on long-term services and supports and the need is expected to rise dramatically in the coming decades. Permit penalty-free (but not tax-free) withdrawal from retirement savings accounts for employer-offered private LTCI. Permitting individuals to use retirement savings to purchase “retirement LTCI” would help defray LTSS costs, which for many Americans depletes retirement savings. Build on previous recommendations to permit Medicare Advantage (MA) plans, and other Medicare provider organizations operating under a “benchmark,” the flexibility to offer a respite care benefit to high-need, high-cost Medicare beneficiaries. Respite care, along with other services, could be offered under this flexibility, so long as the services are part of a person- and family-centered care plan for a subset of individuals that meet the eligibility criteria, which includes patients with three or more chronic conditions and functional or cognitive impairment. Permit Medigap and MA plans to market a limited LTSS benefit as an optional supplemental benefit, or as a separate insurance policy, financed exclusively through additional premiums paid by Medicare beneficiaries who choose to enroll. For the purposes of estimating the added cost of the benefit to Medigap or MA premiums, BPC assumed a $75 maximum daily benefit, with a 180-day elimination period that would need to be satisfied prior to the commencement of the benefit. Consistent with existing Medigap policies, beneficiaries would have a one-time option to purchase this coverage when they enroll in Medicare. BPC’s analysis suggests that such a policy could result in premiums of $35 to $40 per member per month (PMPM). For those who lack sufficient personal resources to pay out-of-pocket, Medicaid is the primary payer of LTSS costs. 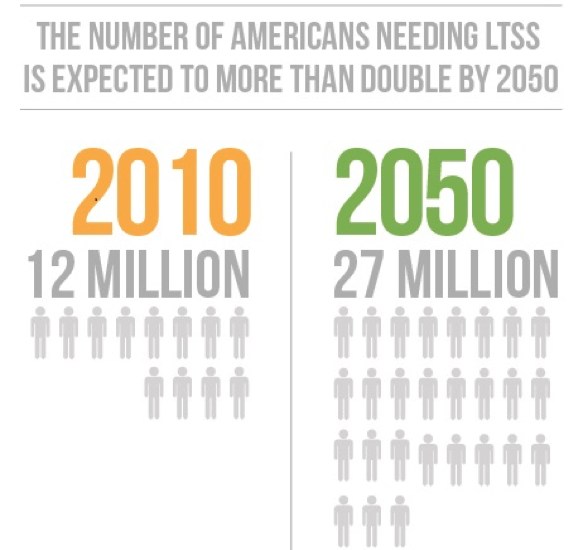 Medicaid is expected to cover about 34 percent of average lifetime LTSS costs of people turning 65 today. 1. Establish lower-cost, limited-benefit retirement LTCI policies. Statutory and regulatory barriers should be cleared to permit the sale of lower-cost, limited-benefit “retirement LTCI.” Retirement LTCI policies would be standardized, with three basic plan designs, each of which would have limited options for customization. Consumers would have choice among basic retirement LTCI features, such as daily coverage amounts, length of benefit period, and the size of the cash deductible, simplifying decision-making. 2. Allow working-age retirement plan participants aged 45 and older to use retirement savings, without early withdrawal penalties, to purchase retirement LTCI. Employees aged 45 and older in defined-contribution retirement plans, such as 401(k) and 403(b) plans, and IRA owners aged 45 and older, would be allowed to take distributions from the plan solely for the purchase of retirement LTCI for themselves and/or a spouse. Distributions for the purchase of retirement LTCI from tax-deferred plans would be subject to income tax but exempt from the 10 percent early withdrawal penalty. 3. Make retirement LTCI policies more widely available by providing incentives for employers to offer them through workplace retirement plans on an opt-out basis. Plan sponsors should be offered a safe harbor and expanded “catch-up” contributions if the sponsor automatically enrolls certain plan participants (who would have the ability to opt out) into a retirement LTCI policy. The proposed safe harbor would limit fiduciary liability for plan sponsors that implement automatic enrollment according to certain standards. 4. Allow retirement LTCI policies to be sold on state and federal health insurance marketplaces. All health insurance marketplaces would have the option to facilitate sales of retirement LTCI policies. Participating marketplaces could accept distributions from workplace retirement plans and IRAs for the payment of retirement LTCI premiums from savers aged 45 and older. 5. Create incentives for states to expand the availability of Home and Community-Based Services (HCBS). Streamline and simplify existing authorities under current law waivers and State Plan Amendments (SPAs) and extend enhanced federal matching to encourage states to take advantage of the new streamlined authority. States should retain the ability to use the existing waiver process, and existing HCBS SPAs should be grandfathered in. Finally, once operational, the HHS secretary should make recommendations to Congress on whether to repeal existing SPAs. 6. Should a catastrophic program be adopted, states that offer expanded HCBS through the new SPA would have lower maintenance-of-effort requirements. We believe that collectively, these policies have the potential to advance the broader understanding of the challenges and policy opportunities, and to provide solutions to challenges faced by patients, their families and other caregivers, private insurers, states, and policymakers. 1 Melissa M. Favreault and Judith Dey, Long-Term Services and Supports for Older Americans: Risks and Financing Research Brief, ASPE, 2015. Available at: https://aspe.hhs.gov/basic-report/long-term-services-and-supports-older-americans-risks-and-financing-research-brief. a BPC, LeadingAge, and The Long-Term Care Financing Collaborative issued separate recommendations outlining a public-private approach to financing LTSS. Additional information available online at: http://www.thescanfoundation.org/side-side-review-long-term-care-financing-policy-recommendations (Accessed June 19, 2017). Milliman, Inc. conducted analysis at BPC’s direction in support of this report. The complete results of the Milliman analysis are available here. Download the complete analysis by Milliman, Inc.